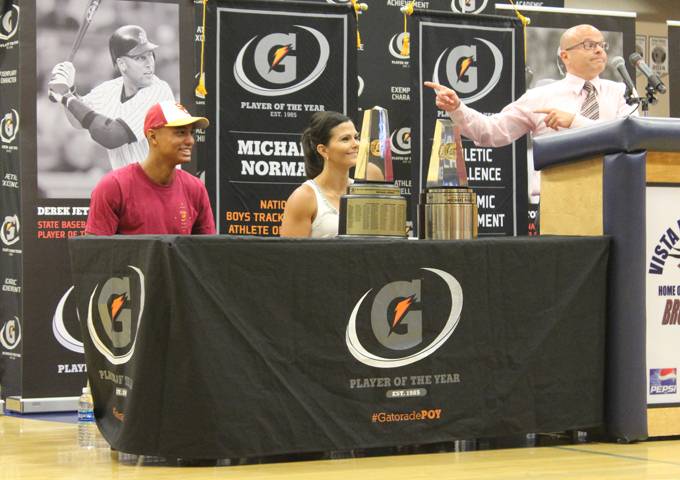 USA Today's Chad Konecky, part of the selection process, speaks about Vista Murrieta High School graduate Michael Norman (far left) as Gatorade representative Keri Lockett listens. It's rather unusual for high school students to line up by the dozens to pose for a photo with and get an autograph from a classmate. But then it's rather unusual for a human being to run 200 meters in 20.15 seconds -- let alone one who just graduated from your school. 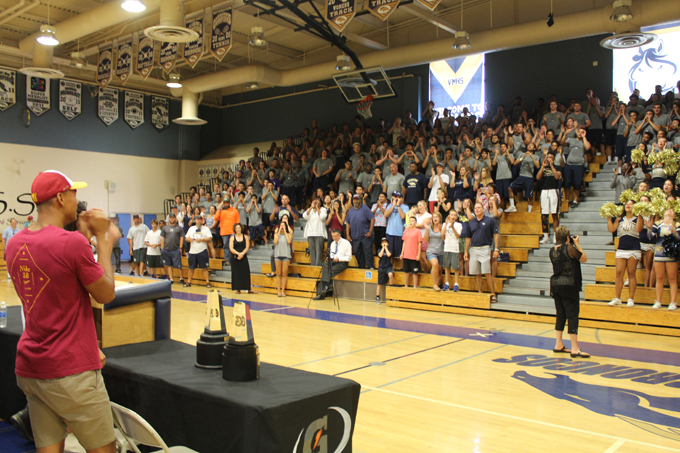 Students, family members, friends and fans packed one side of the Vista Murrieta gym this morning to cheer for track and field standout Michael Norman, who was presented with his second consecutive Gatorade Boys Track and Field National Athlete of the Year award. 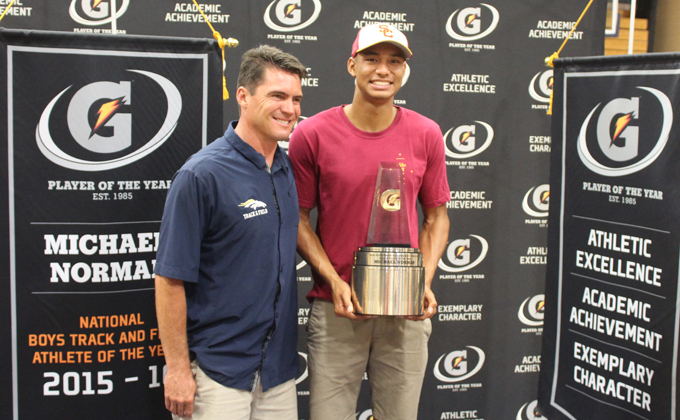 Norman, who graduated earlier this month, becomes the first male track athlete to win the award twice since its inception in 1986. 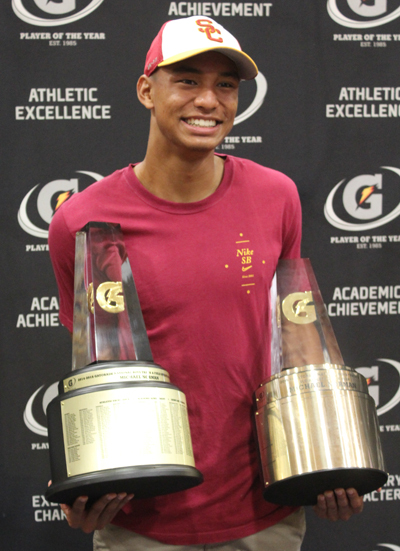 As one of 12 national Gatorade winners in various sports, Norman will attend a ceremony next month where the overall national Player of the Year will be named. He also will compete in the IAAF World Junior Championships in Poland July 19-24 after his personal-best 20.15 clocking in the 200 in the U.S. Junior Championships -- just .02 off the national high school record and one of the fastest times by anyone in the 200 this year. Before all that, however, Norman continues his pursuit of another lofty goal -- a berth on the U.S. Olympic team that will compete in Rio de Janiero, Brazil Aug. 5-21. Shortly after today's ceremony, Norman boarded a plane for Eugene, Oregon, where the Olympic trials begin on Friday. "This is something I'll never get used to," said Norman, who will compete for USC next fall. "It's so weird, having people come up asking for pictures and autographs. It's a really humbling experience and it's just a great feeling." 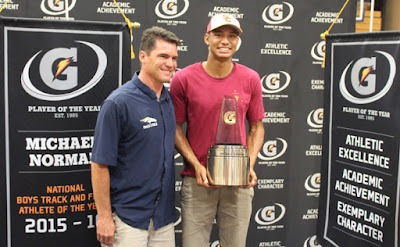 Throughout the season, Norman has worked with head track coach (and athletic director) Coley Candaele (left) on a carefully constructed workout routine, all pointing to these special days ahead. Admittedly, there have been sacrifices along the way -- a special diet, early nights in when friends are still out, and hard workouts. Through it all, Norman has remained the positive young man so many have come to admire. "That's probably the hardest part -- missing out on all these things everyone is doing, like our senior summer," Norman said "My dad keeps me on top of things, reminds me to come home at 10 o'clock on weekdays, things like that. He reminds me these (social) times will come again. I have an opportunity right now that he doesn't want me to waste." Last month, Norman led the Vista Murrieta boys track team to its second consecutive CIF state team title, breaking the 200-meter record in the process with a time of 20.23. He also owns the nation's fastest 400-meter team among high school athletes this year with a time of 45.51. He will compete in both the 200 and 400 at the Olympic Trials. Candaele continues to be amazed by what Norman has done. "There are a lot of great athletes out there," Candaele said. "What makes Michael special is his ability to influence others. If you hang out with Michael Norman long enough, you will be influenced in lots of ways. His influence on me, this school, everybody involved in track and field, and students in the classroom, is a big deal. Because really, he's just a normal human being -- who can run really fast. "Not everybody gets to see what Michael does in practice. His work ethic and preparation is second to none. There's no one in the 22 years I've coached that has worked harder at his craft. He is ecstatic to practice, to do a hard workout and run. Not many can put themselves through that. Michael can, and he loves it." Michael Norman joins his former classmates in a Bronco shout at the end of the ceremony. 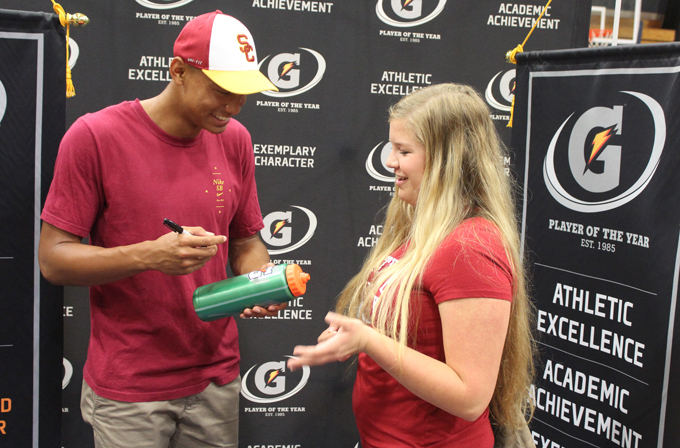 Michael Norman autographs a Gatorade water bottle for a Vista Murrieta student.